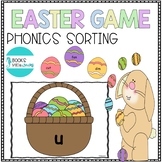 This activity allows students to practice working on decoding words. 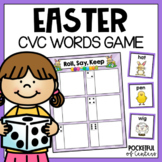 Includes 96 cards featuring CVC words and special game cards. Clip Art by Scrappin Doodles and The 3am Teacher. 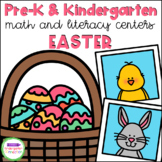 This Easter Activity book is full of Literacy/English Language activities for students in the early years (grades 1-3). PDF file with 30 pages of activities. Use this activity book every year! Use this in literacy centres, small group or whole class work. Fun and cute graphics your kids will love. 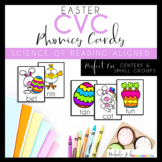 Have students look at the CVC picture on each card and build the word using the matching Easter eggs. 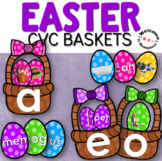 Eggs with consonants are patterned the same and vowels are also patterned the same. 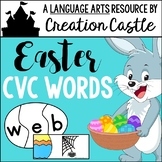 When students have built all of the CVC words they can use the recording sheet to write and record their words. 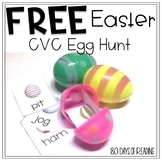 CVC and Word family activities using plastic easter eggs. 16 different CVC pictures - both colour and B/W images supplied. 4 different recording sheets.